It's no accident the sewer has been grabbed by the mud flaps and flung at Reform by the Hudson Reporter with two major government meetings on tap this week. Tonight will see two HHA commissioner candidates representing two vastly different Hoboken views in opposition at the City Council and only one will walk away with the seat. Thursday night the Hoboken Housing Authority Board follows and will swear in a commissioner and hold its annual reorganization on lower Jackson Street. With MSV's breaking exclusive Tuesday, (see below) the Old Guard spin machine has fallen silent. Earlier, the HR got pounded by Grafix Avenger with a factual analysis of minority representation on Hoboken boards (most are volunteer unpaid positions) topped off with some stinging satirical barbs leaving quite a welt. 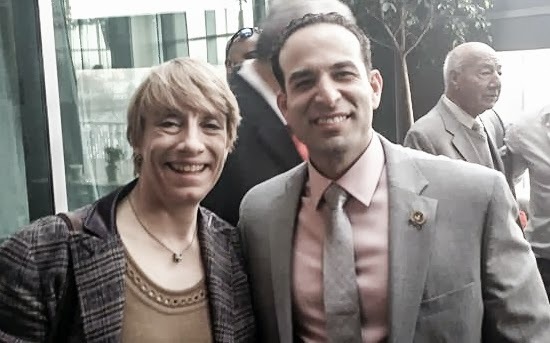 There's been no press release from Beth Mason on yesterday's story airing remarks with the sting of real anti-semitism voiced and paid for by Assemblyman Carmelo Garcia's taxpayer payroll. It makes for some sticky problems among Hoboken corruptocrats. Is a Fernando Uribe video far off to gently deflect from the rancid smell? Will the fish head odor be worse than Beth Mason's underwriting of the 2012 BoE Move Forward Nazi Truck? But tonight Council members Beth Mason and Timmy Occhipinti are sponsoring a resolution to reappoint Carmelo Garcia stalwart Eduardo Gonzalez for another term while Councilman Dave Mello and City Council President Jen Giattino are sponsoring David Dening, a strong supporter of reform efforts with universal accolades from the movement. One of the stakes: it's the never say die swindle of Vision Money Money, aka Vision 20/20; the plan with no Master Plan endlessly foisted upon unsuspecting Hoboken residents and government officials. the anti-Semitic rant surfacing soon after at his April HHA meeting by his paid aide. No public word from either since. Also on tap tonight, an Old Guard council resolution will poke its nose into the BoE looking to further inflame the state funding formula problem dividing Hoboken's four district schools. Down and dirty politics is an Old Guard specialty and this is one opportune time. Nothing gets them more ginned up and BoE issue or not, they'll chow down on it in the wrong forum at the City Council for whatever divisive value possible trading away on Old Hoboken voters (and their children) to score points with the "yuppies" at HoLa and lay into BoE President Leon Gold for his earlier remarks charter schools are "killing" the school district where the majority of students are from lower income families. None of the political noise planned will change the education funding problem exacerbated in Trenton among four distinctly different Hoboken public schools. The defensiveness on the HR website comments looks like an in-house affair but the egg dripping on its publisher and editor's faces is sticky wet. No escaping from that sordid mess anytime soon. Are congratulations due to the bottom feeding fish for another editorial hit job well done? Tonight we'll see for whom the bells tolls; City Council meeting at City Hall begins at 7:00.